Deeply Vale is a valley located to the east of Nangreaves, Bury (due east of Jct 1 of the M66 northbound). 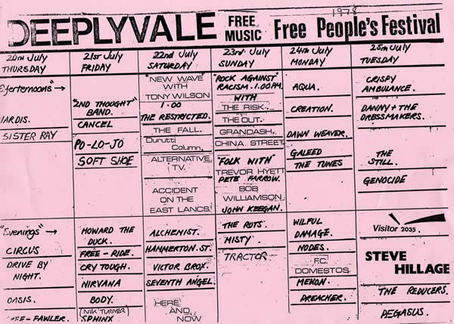 Between 1976 and 1979 it was the site, of one of the legendary Free Festivals and at its peak (1978/1979), 20,000 people were attracted to listen to the likes of Steve Hillage, Nik Turner (ex Hawkwind) and local “New Wave” bands like The Fall and The Durutti Column. It was one of (if not THE) first festivals where the hippy counter-culture intersected with Punk. 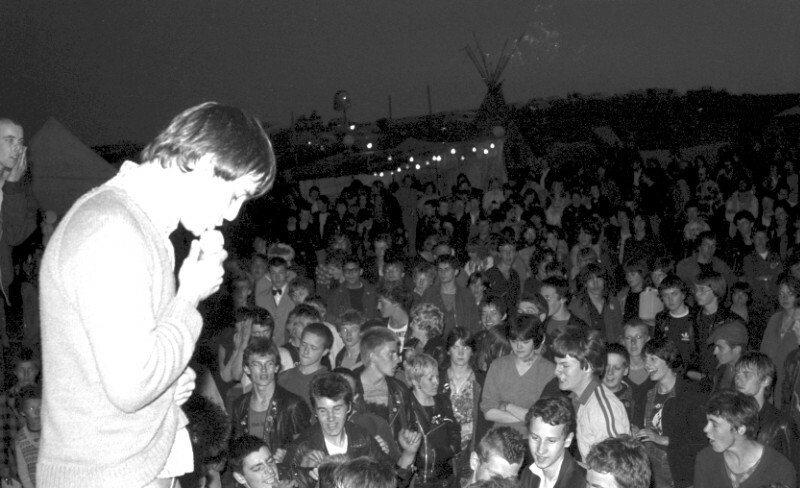 For those of you at a tender age, I was JUST too young to attend the 1979 Festival (my first “gig” – The Damned – being on 10th December 1979) and it was a source of deep regret. However, given it’s relatively remote location, I probably would never have made it back to Salford! The Deeply Vale Brewery therefore, has quite a romantic name in local terms (although Greater Manchester Police CID in 1979 may not have agreed. They were – legend has it – kept from the site!). The name is derived from the fact that James’ (Brewer/Owner) family originate from that area. Founded in 2012 near the centre of Bury by James Stewart and his parents, the brewery has quickly gained a reputation from drinkers and licensees alike for the excellence and consistency of his beers including the multi-award winning Breakfast Stout DV8. 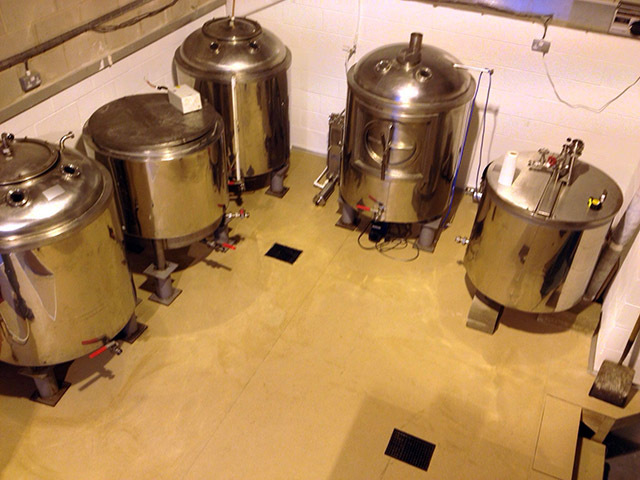 James started to think about commercially brewing (being a full mash home brewer from a young age) whilst working at the noted Bury alehouse Trackside and started to look for premises eventually finding one on the Peel Industrial Estate. Brewing commenced in 2012 and they now make a core range of beers including Still Walking (sampled later) a 3.8% “bitter”, Golden Vale at 4.2% and DV8, the strongest at 4.8% abv. Turning up at The Salford Arms I said a quick “Hello” to somebody I recognised from Twitter. This was Helen, partner of James Stewart the brewer. Jaz turned up along with a few others (including a fine turnout from the Bolton CAMRA Branch!) and I began to think that this might just be better attended than the last events. By the time we all settled in the front room, there were 15 or more people, which was gratifying to see and at least stopped James & Helen from feeling lonely! Then someone leaned over toward me and I realised it was Darren, who created the Gtr Manchester Ale News website / internet magazine. We’d been trying to meet for a pint for ages! We had a cracking chat,certainly a man who knows his beer. The brewery operates on a 2.5 barrel plant (1 barrel = 36 gallons or 4 firkins) and he brews 2 or 3 times a week spending the rest of the time doing the admin or distributing the beer around the area. What was really good to hear was the little “co-operative” that appears to exist between 3 Micros, Deeply Vale, Privateer & Ringway. They help each other out, distribute each others beers and even help to break new markets (The Ringway brewer – being a Geordie – will be looking to break the Co-Op beers into the vibrant Newcastle beer scene. Rather than 4 halves of different beers, given that James doesn’t bottle yet, we had but two beers on draught on the bar. First up was Still Walking, the “hoppy session ale”, a Pale Ale to my eyes. A lovely clear golden beer with a gentle fruity grapefruit nose (Cascade hops). A fruity easy drinking beer, medium bodied and really smooth with just the right amount of bitterness in the finish. A lovely refreshing easy drinking session beer. By this point, this had become like a bit of a round table chat between like-minded people. This was really fun and quite intimate. Lots of people asking questions and voicing opinions, all in the spirit of the evening, which was really convivial. Next beer up was the one of which James said he was most proud of. Being a fellow lover of dark beers and Stouts in particular, I’m with him on that one! DV8 is the beer in question, describer by James as a Breakfast Stout as it is, effectively, an Oatmeal Stout. A fabulous smoky aroma to this. Wonderfully full-bodied and creamy, lots of chocolate in here with the undertone of smokiness. A tremendous Stout, one that we should see more of around Manchester. As the nights draw in and the wind starts to blow, this is the time when a beer like this, in front of a real fire would go down a treat. Just need to find such a place in Manchester. Ideas anyone? One of the questions that came up was regarding bottling. james intends to put together a small bottling plant himself, rather than sending the beer elsewhere for packaging. A smart move really. Keeping quality control of his beers from start tp finish. Tying into this is the possibility of using his skills – possibly moving the small plant in his Dads’ garage into the brewery – is the idea (floated from the room) of doing seasonal beers. James was already considering an Imperial Stout and one that caught MY imagination was the thought of a Chocolate & Cinnamon Stout or a Xmas pud Stout? I offered to do some serious mashing, always willing to help, me! For a bottle or two of course! A further gloriously creamy pint of DV8 followed whilst Darren, Jaz & I had a further chat. I seriously like Darren’s internet ‘paper, always informative and definitely worth a read if you drink around the Manchester area, check it out here. Darren had to make a move, so Jaz and I also said our farewells to James & Helen and Ken & Tom from the pub and moved on to the Mark Addy where my pint of the beautiful Dark Revenge by Privateer had something missing, a little lacking in condition. Not as good as that beer usually is for sure. Jaz was more than happy with his Gin Pit by Allgates. Located in the former kitchens of the Manchester & Salford Childrens Mission (you can still see the name in the brickwork above the entrance!) this is just one seriously cool bar! Quite quiet but with some cracking eclectic tuneage. A great beer on draught too. Kitty Hawk by Privateer. This was MORE like it! The only thing was, I couldn’t quite bottom the flavour! Certainly made me think this one, good body to it for a 4%, I presume it was the hops, but there was a real savoury element to this, almost a touch salty? Whatever it was, both Jaz & I LOVED it. They do make some cracking beers on that there Temperance Street! (AND – Rumour has it that they may be on the move! Stay tuned! Having missed my bus, it was time for a quick half of Harbour Breakfast Stout on keg. Quite oily and heavy, this (at 8.5% abv) was more like an Imperial with lots of strong bitter coffee/chocolate and a high degree of bitterness in the finish. A proper sleeping draught!!! Anyway, all good things must come to an end, as did this particular evening. One of the best MTBs I had been to. A lovely friendly chatty couple (James & Helen), excellent company from the Bolton contingent (Pete, Linda & Graham) and meeting Darren. Yes. A good evening all round!